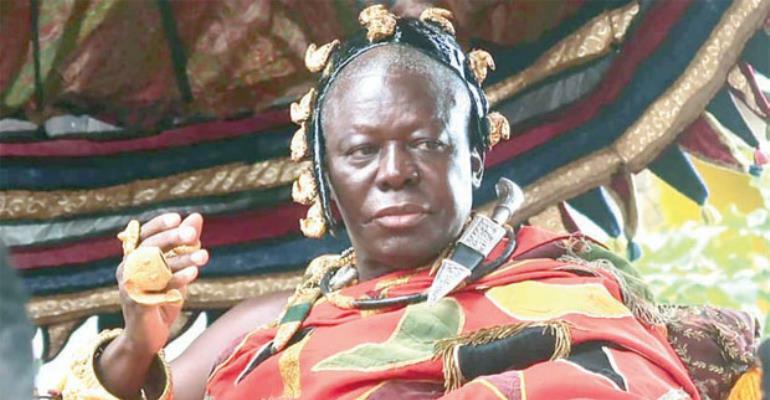 Otumfuo Osei Tutu II, stole the show during ‘Nsuman Agro,' one of the major traditional programmes of Asanteman, at the Manhyia Palace in Kumasi on Monday. Otumfuo usually dances to some unique traditional tunes together with some selected Asante chiefs during Nsuman Agro. During Monday’s edition, Otumfuo majestically danced with the Apagyahene, Oheneba Owusu Afriyie, Baffuor Agyei Fosu Twitwiakwa, Anantahene and Baffuor Yaw Boateng, Dominasehene. Interestingly, chiefs that are allowed to dance with Otumfuo on that particular day are allowed to push Otumfuo during the event. Otumfuo, who is marking the 20th Anniversary of his ascension to the Golden Stool, displayed traditional dancing skills which attracted applause from all. There were shouts of “King Solomon, King Solomon,” as Otumfuo took some exquisite steps on the dancing floor. The ‘Nsuman Agro’ forms part of activities marking Otumfuo’s 20th Anniversary in Asanteman. Several activities have been lined up to mark the anniversary which would be climaxed on April 21, 2019 with a grand durbar.